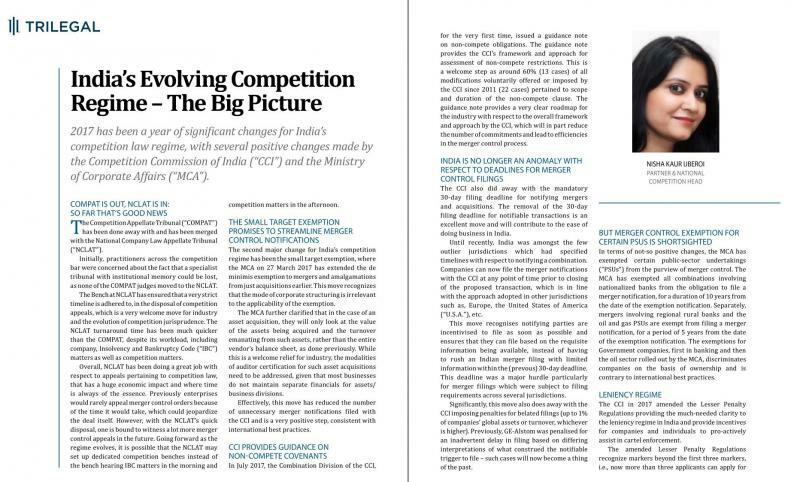 2017 has been a year of significant changes for India’s competition law regime, with several positive changes made by the Competition Commission of India (“CCI”) and the Ministry of Corporate Affairs (“MCA”). Initially, practitioners across the competition bar were concerned about the fact that a specialist tribunal with institutional memory could be lost, as none of the COMPAT judges moved to the NCLAT. The Bench at NCLAT has ensured that a very strict timeline is adhered to, in the disposal of competition appeals, which is a very welcome move for industry and the evolution of competition jurisprudence. The NCLAT turnaround time has been much quicker than the COMPAT, despite its workload, including company, Insolvency and Bankruptcy Code (“IBC”) matters as well as competition matters. Overall, NCLAT has been doing a great job with respect to appeals pertaining to competition law, that has a huge economic impact and where time is always of the essence. Previously enterprises would rarely appeal merger control orders because of the time it would take, which could jeopardize the deal itself. However, with the NCLAT’s quick disposal, one is bound to witness a lot more merger control appeals in the future. Going forward as the regime evolves, it is possible that the NCLAT may set up dedicated competition benches instead of the bench hearing IBC matters in the morning and competition matters in the afternoon. The second major change for India’s competition regime has been the small target exemption, where the MCA on 27 March 2017 has extended the de minimis exemption to mergers and amalgamations from just acquisitions earlier. This move recognizes that the mode of corporate structuring is irrelevant to the applicability of the exemption. The MCA further clarified that in the case of an asset acquisition, they will only look at the value of the assets being acquired and the turnover emanating from such assets, rather than the entire vendor’s balance sheet, as done previously. While this is a welcome relief for industry, the modalities of auditor certification for such asset acquisitions need to be addressed, given that most businesses do not maintain separate financials for assets/ business divisions. Effectively, this move has reduced the number of unnecessary merger notifications filed with the CCI and is a very positive step, consistent with international best practices. In July 2017, the Combination Division of the CCI, for the very first time, issued a guidance note on non-compete obligations. The guidance note provides the CCI’s framework and approach for assessment of non-compete restrictions. This is a welcome step as around 60% (13 cases) of all modifications voluntarily offered or imposed by the CCI since 2011 (22 cases) pertained to scope and duration of the non-compete clause. The guidance note provides a very clear roadmap for the industry with respect to the overall framework and approach by the CCI, which will in part reduce the number of commitments and lead to efficiencies in the merger control process. The CCI also did away with the mandatory 30-day filing deadline for notifying mergers and acquisitions. The removal of the 30-day filing deadline for notifiable transactions is an excellent move and will contribute to the ease of doing business in India. Until recently, India was amongst the few outlier jurisdictions which had specified timelines with respect to notifying a combination. Companies can now file the merger notifications with the CCI at any point of time prior to closing of the proposed transaction, which is in line with the approach adopted in other jurisdictions such as, Europe, the United States of America (“U.S.A.”), etc. This move recognises notifying parties are incentivised to file as soon as possible and ensures that they can file based on the requisite information being available, instead of having to rush an Indian merger filing with limited information within the (prevous) 30-day deadline. This deadline was a major hurdle particularly for merger filings which were subject to filing requirements across several jurisdictions. Significantly, this move also does away with the CCI imposing penalties for belated filings (up to 1% of companies’ global assets or turnover, whichever is higher). Previously, GE-Alstom was penalised for an inadvertent delay in filing based on differing interpretations of what construed the notifiable trigger to file – such cases will now become a thing of the past. In terms of not-so positive changes, the MCA has exempted certain public-sector undertakings (“PSUs”) from the purview of merger control. The MCA has exempted all combinations involving nationalized banks from the obligation to file a merger notification, for a duration of 10 years from the date of the exemption notification. Separately, mergers involving regional rural banks and the oil and gas PSUs are exempt from filing a merger notification, for a period of 5 years from the date of the exemption notification. The exemptions for Government companies, first in banking and then the oil sector rolled out by the MCA, discriminates companies on the basis of ownership and is contrary to international best practices. The CCI in 2017 amended the Lesser Penalty Regulations providing the much-needed clarity to the leniency regime in India and provide incentives for companies and individuals to pro-actively assist in cartel enforcement. The amended Lesser Penalty Regulations recognize markers beyond the first three markers, i.e., now more than three applicants can apply for leniency. Such subsequent applicants (after the third applicant), will also be eligible for reduction in penalties of up to 30%, provided they assist in giving ‘significant added value’ to the evidence already in the possession of the CCI. Since there is no longer a cap on the number of leniency applicants, this amendment provides a clear incentive for more cartel participants to come forward and disclose the existence of a cartel. It also brings the Indian leniency regime in line with the leniency regime in the U.S.A. and is a step in the right direction. Separately, the amended Lesser Penalty Regu­lations permits access to documents in the possession of the CCI to not only leniency applicants but also to non-leniency applicants, including third parties who have been impleaded in leniency proceedings. The amendment grants those who have the right of access to file, the right to obtain copies of the non-confidential version of the evidence and information submitted by the leniency applicants, after the Director General’s investigation report (“DG Report”) has been sent to the parties. This effectively addresses the single largest complaint under the earlier leniency regime in India (of non-access to any information filed by leniency applicants), which resulted in several non-leniency applicants approaching High Courts by way of writs, to gain access to information provided by a leniency applicant. It also balances the confidentiality requirements under a leniency regime, while addressing the rights of defence for non-leniency applicants and is in line with the approach adopted by the European Commission. In June, the CCI fined Hyundai INR 87 crores for its practice of maintaining and monitoring the maximum discount offered by its car dealers, including penalties for non-compliance with the suggested discounts. This is the first case relating to resale price maintenance where penalty was imposed and this sent a clear signal to the industry that while monitoring of downstream prices may not be problematic, even threats against deviation from the suggested price/discount can be regarded as resale price maintenance. In the same case, Hyundai was also found to be engaged in a tying arrangement concerning lubricant oils. The CCI found that Hyundai’s dealers were forced to provide lubricant oil to customers from two lubricant oil manufacturers with whom Hyundai had entered into agreements and Hyundai communicated this requirement to its dealers through bulletins. The CCI passed cease and desist orders against certain national and regional trade associations of film artists and producers for engaging in practices of limiting and controlling the services in the Western Indian film and television industry. The CCI rejected arguments raised by parties that they were exempt as trade unions. However, the CCI considered substance over form in considering whether a party constituted an enterprise under the Act, as recently held by the Hon’ble Supreme Court in its examination of an enterprise in the Co-ordination Committee of Artist and Technicians of West Bengal Film and Television Industry vs. CCI. In 2016, the CCI ordered an investigation into whether Monsanto abused its dominant position as a supplier of genetically modified cotton seeds and also imposed vertical restraints in the sub-licensing agreements entered into with the informants. In 2017, during the investigation, the Director General (“DG”) directed Monsanto to provide information eight times, which the company failed to provide. Monsanto filed a writ petition in the Hon’ble High Court of Delhi that it would not provide the information immediately or would provide it on a ‘without prejudice’ basis. While Monsanto eventually provided the said information, the CCI imposed a penalty of INR 2 crores on Monsanto for non-co-operation. The CCI’s penalty signals its “zero tolerance” approach to non-co-operation during investigations, even if parties have challenged the CCI’s proceedings in the High Courts. In other words, a failure to co-operate will lead to penal consequences. Another seminal order by the CCI was its order in the information filed by Meru Cabs and Fastrack Cabs against Ola Cabs. The CCI found that Ola Cabs was not dominant in the market for “radio taxi services in Bengaluru”, and was the first case where the CCI considered two-sided markets, the role of technology in reducing transaction costs, as well as the role of an early adopter of disruptive technology. More importantly, the CCI explained why a non-interventionist approach is required for nascent and evolving markets to evolve and innovate, as an intervention in a nascent market has the potential of disturbing market dynamics and providing a sub-optimal solution. The CCI is expected to come out with its order investigating Google, and it will be interesting to see the position it adopts and whether it will follow the Ola approach. In the Delhi Jal Board alleged bid-rigging case, the CCI rejected the argument of a single economic entity (SEE) advanced by Grasim Industries Limited (Grasim) and Aditya Birla Chemicals (India) Limited (ABCIL), despite the CCI’s own merger control order adopting and recognizing that Grasim and ABCIL are part of a SEE. The CCI tried to reconcile its merger control order by stating that the word “group” is not found in section 3 relating to anti-competitive agreements (but is present on Sections 4 and 5 relating to abuse of dominant position and merger control) and resultantly the defense of SEE will not be applicable for Section 3 cases. The CCI further held that this defense would not be applicable in public procurement cases involving tax payer’s money, where entities of one group purportedly behaved as independent undertakings. It is essential that for clarity and consistency the CCI should consider adopting a consistent definition of ‘group’ and SEE for the application to the Competition Act, 2002 (“Act”) and not create an artificial segmentation of Sections 4 and 5 vis-à-vis Section 3. The need for such clarity is also important given that corporate entities should have the flexibility to conduct business through multiple vehicles in the same group. On the merger control front, in addition to further streamlining the merger notification process in line with international best practices, the CCI has top scored on its timelines for assessing notifiable mergers. The CCI’s average review time for notifiable transactions has been reduced from approximately 34 working days on an average in 2016 to approximately 24 working days on an average in 2017 – this despite the CCI having limited resources in the merger control division when compared to its international counterparts. The annual review of the combination regulations where the CCI continually addresses industry concerns has yielded great results. The merger control regime is “almost perfect”, and one key change which remains on the industry’s wish list is the right of hearing before the CCI can invalidate a merger notification – which it currently can, and does, without affording notifying parties a right to be heard. The economy has been witnessing an incredible amount of consolidation across sectors such as, telecom in India. Globally, 2017 saw major consolidation amongst the agro-chem and fertilizer industry with giants such as, Dow Chemicals, DuPont, Syngenta, China Nationals Agrochemical, Bayer and Monsanto, all being part of mergers or acquisitions in the sector. The CCI has indicated its preference for structural modifications as opposed to behavioral commitments to remedy competition concerns that arise from transactions. This has meant that the CCI has had to scrutinize and assess near simultaneous mergers between competitors and has done a commendable job of ensuring timely reviews of consolidation in the market, despite having a skeletal team. In the telecommunication sector, the CCI un­conditionally approved the Idea-Vodafone merger in under four months and it was the first regulator to do so, even before the Securities and Exchange Board of India (“SEBI”), National Company Law Tribunal or the telecommunication’s regulator. This merger involved complex economic analysis, multiple relevant markets and a sector which was witnessing a series of consolidations among players. In fact, in 95% of all notified transactions involving approvals from more than one regulator or schemes filed with the Courts, the approval from the CCI has always come first. The CCI has also begun to consider other potential effects that a transaction may result beyond a particular relevant market. In the assessment conducted into the notification provided by three Japanese shipping and logistics entities for the formation of a joint venture in the container terminal business worldwide, namely NYK, MOL and K-Line, the CCI for the first time also considered potential “spill-over effects”. The CCI conducted the competition assessment keeping in mind the effect of the joint venture with respect to other shipping related businesses such as, bulk shipping, car transport services, logistics, and freight forwarding services, maritime training, ship management and manning etc. in which the parties were engaged. The CCI approved this joint venture after the notifying parties offered certain voluntary commitments to ensure that the joint venture would not result in the exchange of information between the notifying parties and the employees of the joint venture were to adhere to certain restrictions on sharing of information. The CCI has evaluated multiple sectors and, has over time, developed sectoral expertise in relation to sectors such as agro-chem, cement, pharmaceuticals and telecommunications. In-depth market knowledge coupled with economic tools for relevant market delineation have led to the evolution of a robust merger control regime which is not just efficient but efficacious as well. The Hon’ble Supreme Court of India has finally settled the issue of “turnover” in respect of which penalty can be imposed by the CCI. It is now clear that an enterprise can only be penalised with respect to turnover pertaining to those of its businesses which violated the Act, and not with respect to its entire turnover. However, given that CCI has the ability to levy India’s highest economic penalties, it is critical for the CCI to formulate penalty guidelines which will serve as a barometer to guide the industry. In 2018, the NCLAT is expected to decide upon several contentious matters which are currently on appeal. We foresee continued enforcement action being undertaken by the CCI in the agrochemical sector and pharmaceutical sectors as evidenced by the CCI’s scrutiny of the Bayer Monsanto deal. Finally, the 2018 International Competition Network (“ICN”) Annual Conference is being hosted by the CCI in New Delhi from 20 March 2018 to 23 March 2018, where the CCI and other international competition authorities will share their experience in enforcement and merger control. It is expected that these discussions will further strengthen the Indian competition regime, improve and evolve its procedures. Further to contribute to the ease of doing business in India, and given that a substantial majority of the CCI’s matters originate in Mumbai, it is imperative for the Government to set up benches of the CCI in Mumbai. SEBI, the securities market regulator has 19 offices across India and for ease of doing business, the Government should replicate this model for the CCI starting with India’s financial capital. Nisha Kaur Uberoi is a Partner and the National Head of the Competition Law Practice at Trilegal, leading one of the largest competition law teams in India. Previously, she was co-heading the competition practice at AZB & Partners and headed the competition law practice at Cyril Amarchand Mangaldas – which she set up. Nisha started her career with Amarchand Mangaldas in 2002. Nisha advises on a full range of competition matters, including cartel enforcement, abuse of dominance, leniency applications, merger control, competition law audit and compliance. Nisha represents clients in cartel investigations as well as abuse of dominance proceedings and regularly appears at the Competition Commission of India (CCI), the National Company Law Appellate Tribunal (NCLAT) and the Supreme Court regularly. Nisha is currently the lead lawyer on the alleged cement cartel case, where she is representing ACL, a LafargeHolcim company, in which the cement companies were penalized approximately USD 1.6 billion by the CCI. Nisha is currently defending companies in alleged cartels across several sectors, including inter alia, tyre, cement, auto-parts and shipping liner businesses. 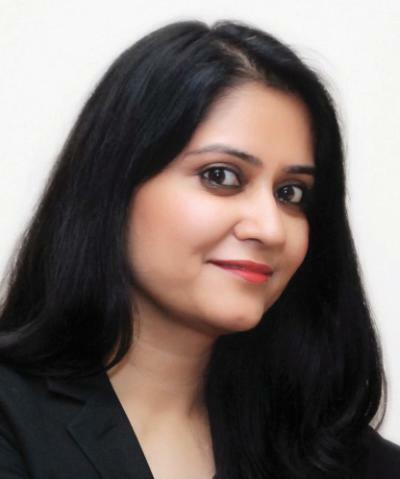 She has successfully represented several high-profile clients in complex, precedent-setting behavioural matters, including the Board of Control for Cricket in India, Ola, International Spirits and Wine Association of India, International Air Transport Association, Gujarat Gas Company Limited, Prestige Estates Projects Limited, etc. Nisha has advised on several complex merger control cases, including India’s first two Phase II investigations involving divestitures, Sun Pharmaceuticals/Ranbaxy USD 4 billion merger and the Lafarge/Holcim Euro 41 billion merger. She recently obtained an unconditional approval on the USD 22 billion Idea-Vodafone merger. She has obtained a significant number of merger control clearances in India (200 of an approximate total of 497 merger notifications), having particular expertise in acting for clients in Form II (long form) merger notifications (10 of an approximate total of 16) filed with the CCI. Her significant merger control clearances include the Etihad/Jet transaction, the Kotak Mahindra/ING USD 2.4 billion merger and UltraTech/Jaypee USD 3.3 billion acquisition of cement assets across India. Nisha is internationally recognized as one of India’s leading competition lawyers, including being recognized by Chambers, Who’s Who Legal: Competition, IFLR 1000, Asia Law Leading Lawyers and Euromoney Women in Business. Nisha has also featured in the inaugural ALB Asia’s 40 under 40, GCR 100 Women in Antitrust as well in the A-List of India’s top 100 lawyers by India Business Law Journal and Indian Corporate Counsel Association. The RSG India Report (2013) details her as “one of the most excellent Competition lawyers in India” for her work in this field. Nisha currently serves as India’s Non-Governmental Advisor for the International Competition Network (ICN). She is a member of the Unilateral Conduct Working Group for the International Bar Association, 2017. Nisha also serves a member of the Permanent Working Group of the IBA Antitrust Committee on Non-Cartel Behavioural Issues and is a member of the Ad Hoc Working Group on Merger Control of the IBA Antitrust Committee. Nisha is an alumnus of National Law School of India University, Bangalore and did her LL.M. from the National University in Singapore with a focus on Comparative Competition Law and Law and Economics. Trilegal is one of India’s leading law firms with offices in five of India’s major cities - Mumbai, New Delhi, Bangalore, Hyderabad and Gurgaon. We represent clients on a large number of the most complex and high value transactions in India. We believe that the combination of our firm’s culture, the depth of our transactional experience, the wide range of our expertise and the quality and energy of our lawyers, allows us to offer a level of client service that is unique in the Indian legal market. We take a commercial perspective of the issues our clients face with the aim of developing a solution-oriented approach. Our areas of expertise include competition law; mergers and acquisitions; strategic alliances and joint ventures; private equity and venture capital; energy and infrastructure; banking and finance; restructuring; capital markets; telecoms, media and technology; dispute resolution; regulatory; labour and employment; real estate; and taxation. Our client roster includes many of the world’s leading corporations. We provide our clients seamless, efficient and integrated service across a broad spectrum of practice areas. Is the NCLAT really fast when it comes to Competition Cases? The lawyers i've worked with have said that the NCLAT is overburdened and the focus appears to be on getting the insolvency cases decided. On the competition front, it hasn't passed a single substantive decision in a year.